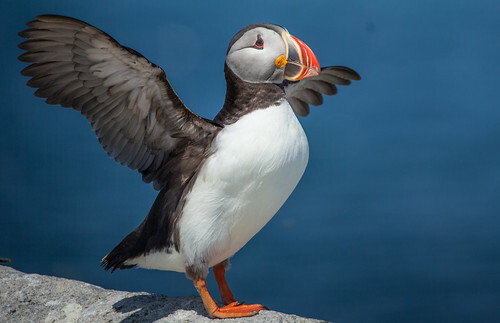 Machias Seal Island, on the border between the Bay of Fundy and the Gulf of Maine, is the most southern North American island on which Atlantic Puffins have continuously nested during historic times. 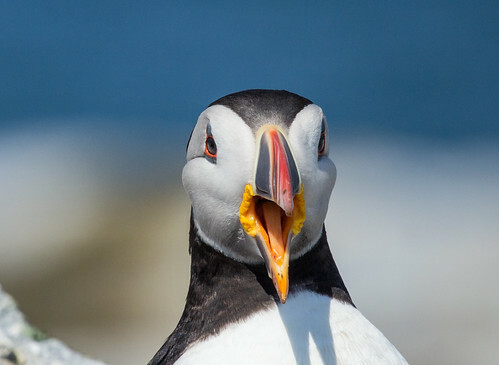 Puffins have been reintroduced to other Maine islands via wonderful reintroduction projects started by Audubon’s Steve Kress, but only after being extirpated from them–people once collected their eggs and slaughtered them for meat and feathers. 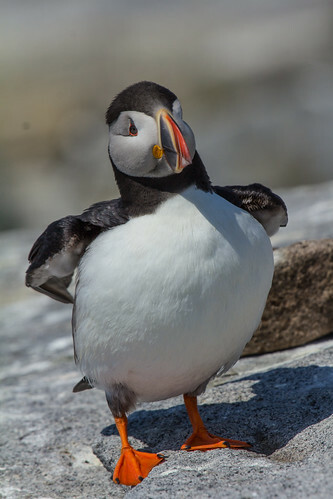 I wanted to see puffins and other seabirds for my Conservation Big Year, and chose Machias Seal Island for three reasons. First, it was the least expensive choice, and I’m birding on a very limited budget this year. Second, it was the one island on which, depending on weather, I had a chance to actually go on the island to see the puffins up close and personal from an observation blind. 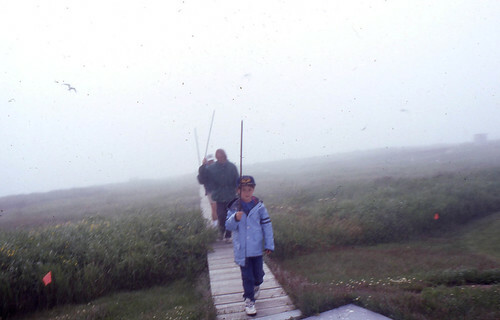 And third, I’d gone to Machias Seal Island 20 years earlier with my family, and wanted to see which things have changed and which remained the same. The boat company that brings people to the island has changed. Instead of Barna Norton’s boats leaving from Jonesport, Maine, Captain Andrew Patterson’s Bold Coast Charter boats leave from Cutler Harbor. And the trips are in higher demand nowadays. In 1993, I managed easily to get tickets for the five of us only a few days in advance. This time I hoped to go on a weekend, bringing my daughter and her significant other, but at the end of April, there wasn’t a single weekend opening left all summer. Indeed, there was only one single space on the boat left for the entire months of June and July, for June 19, so I grabbed it and worked my itinerary around that. The weather looked perfect when we took off, but we were all painfully aware that it had looked equally beautiful the day before, when the boat couldn’t alight on the island because high ocean swells made it too dangerous. So we took off at 8 am with fingers crossed. We didn’t see much by way of seabirds until the island was in view, but suddenly there they were, flying overhead and swimming all about us. Changes in the Gulf Stream and other ocean currents associated with climate change have been warming the waters around the island. Cold waters hold much more oxygen than warmer waters do, and fish move with the currents, so fish populations have been dropping throughout the area. 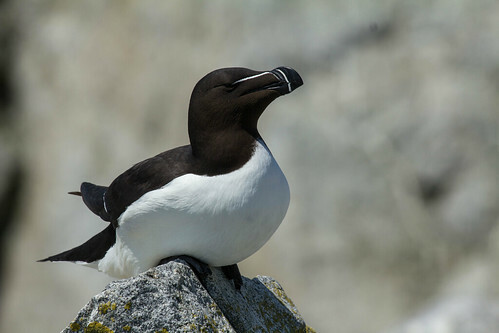 This winter Razorbills, lovely little black-and-white auks, have been moving much further south in the Atlantic, apparently desperately searching for food. Several dead ones that hadn’t been devoured by sharks washed ashore along the Florida coast, and I added the species for my year list in Florida, where they simply don’t belong. I was very worried that their numbers would be low on the island, but so far declines haven’t been apparent according to the captain. 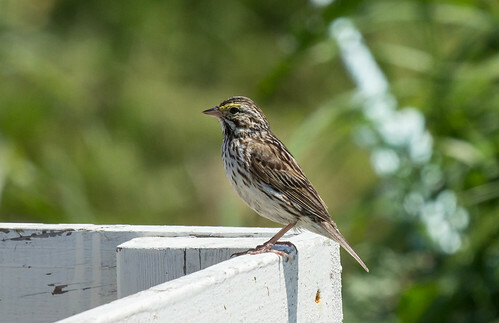 It’s likely that it was mostly younger birds so desperately searching for food this winter, and because they never breed until they’re at least four years old, and usually five or six, it’s not surprising that the breeding population on the island seemed about normal. The captain assured us that there were plenty of puffins to see but noted that there are fewer puffins than normal, which is troubling. 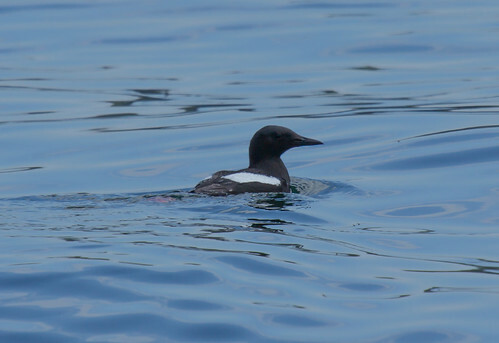 I also remember seeing far more Black Guillemots in 1993 than this time–we saw only a single pair, and they were actually right in the Cutler Harbor. 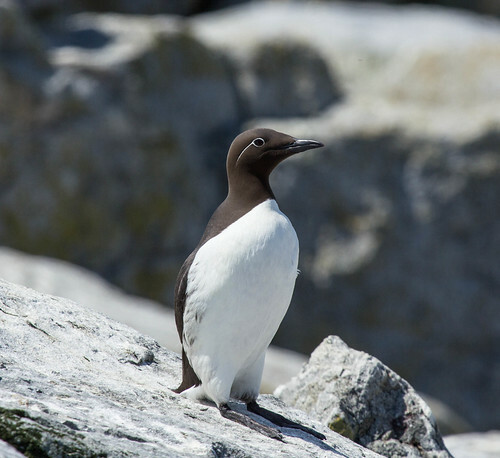 I can’t remember how the Common Murres compare, but we did see quite a few. 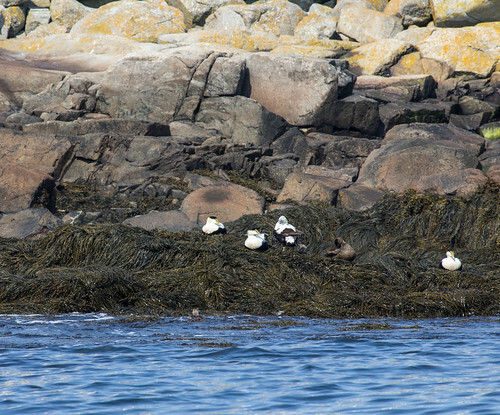 This spring was late, and I was there 2 weeks earlier than last time, so I didn’t see any Common Eiders with chicks, but the banks of the island were dotted with stunning males and harder-to-see females. As we approached, anxious about landing conditions, the captain suddenly announced that everything was perfect for a landing. 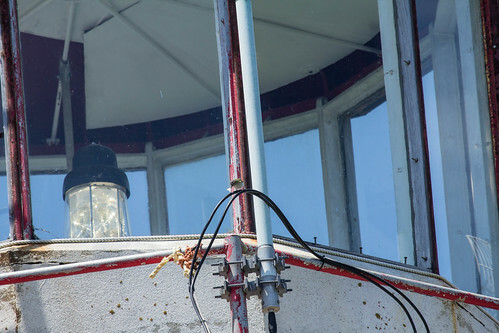 Not even a small passenger boat can draw close to the island—the Canadian Coast Guard lighthouse attendants and their supplies are flown in by helicopter. So our captain and his assistant brought the 17 of us to the island in three shifts on a much smaller boat we’d pulled behind us. We moved along slowly to minimize disturbance of the swimming birds, but suddenly, there I was! When the captain cut the engine, the first thing I noticed was an eerie quiet. There were plenty of seabirds about, but I didn’t see a single Arctic or Common Tern. Their raspy squawks had dominated the soundscape in 1993, but the captain said their nesting colony had completely crashed. 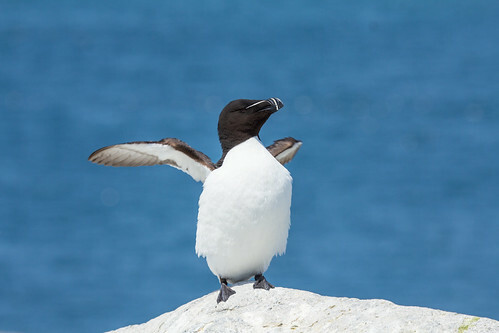 My heart felt heavy even as it swelled seeing dozens of puffins and razorbills swimming all about and flying overhead. No eggs had hatched yet, so none of them were carrying fish to nesting burrows, but their adorably plump little bodies and matchless faces held me in awe. Half the passengers were birders on an organized tour with a professional guide. We had more people than spaces in blinds, so those of us who were on our own went into the blinds for the first hour-long shift while the people on the tour were briefed by their guide for the second shift. I shared a blind with a couple whose last name was also Erickson. The captain’s assistant led us to the tiny shack, showed us how to operate the windows, and cautioned us to never open the windows on opposite sides at the same time, so that the birds couldn’t see us. He closed the door, and we were on our own. Opening the windows was like the moment in the movie The Wizard of Oz when Dorothy opens the door from her black-and-white tornado-blown house into a vividly colorful Munchkin Land. The sky was intense blue, and atop dozens of gray rocks spattered with white was at least one glorious puffin. My camera lens is a 100-400 mm zoom. Many of the puffins were so close that unless I pulled the lens in, I couldn’t get the whole bird in the picture. 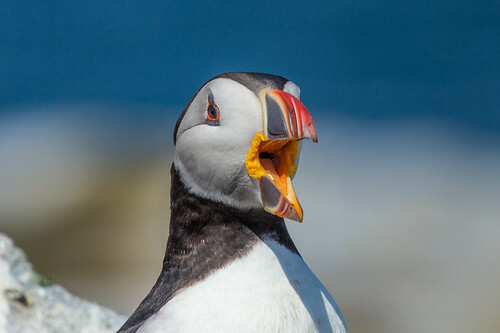 I got some thrilling close-ups, including one showing the spiny roof of a puffin’s mouth. When a puffin catches a fish, it can use its raspy tongue to brace the fish against the spines while it opens its beak to catch another fish, which in turn is braced against the spines so it can catch yet another. 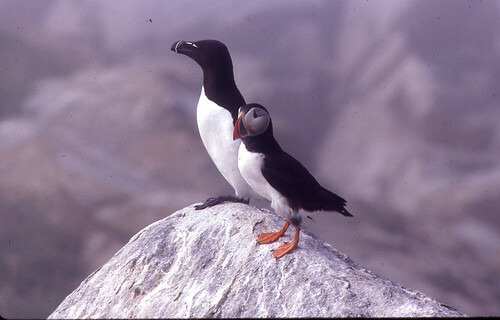 Puffins carry an average of 10 fish back to the nest when feeding young. The record, off Great Britain, was a puffin managing to carry an amazing 62 fish at once. 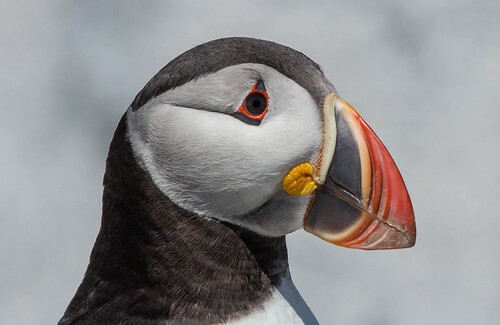 I have several shots showing how the brilliant orangey-yellow circular markings at the gape of a puffin’s bill are actually soft, fleshy, flexible tissue that opens up so that, when carrying fish, the upper and lower mandibles can both be held horizontally, putting even pressure on every fish from front to back. 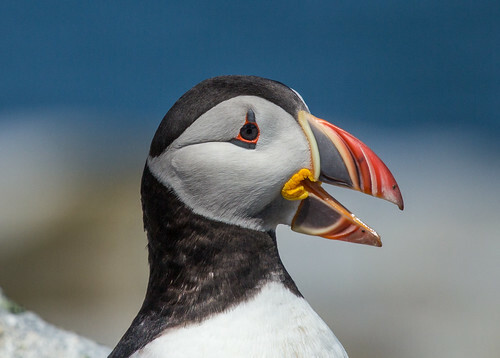 Most bird bills are tightly angled, which wouldn’t allow puffins to grasp any fish at all near the tip if they were holding fish further back. The tight angle would also slice off both ends of fish near the back of the bill if the bill were grasping fish near the tip. Now I want to go back to Machias Seal Island next year later in the season to get photos of them holding numbers of fish. 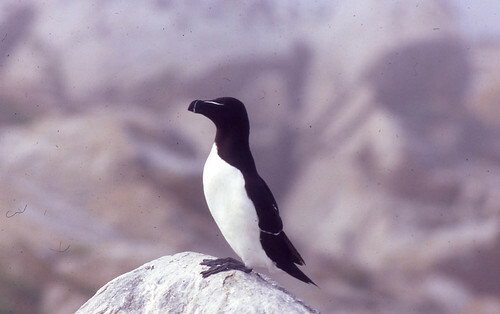 In 1993, my whole family was charmed by the puffins, but Tommy’s favorites were the stately Razorbills, so I made a special point of photographing as many of them as I could. 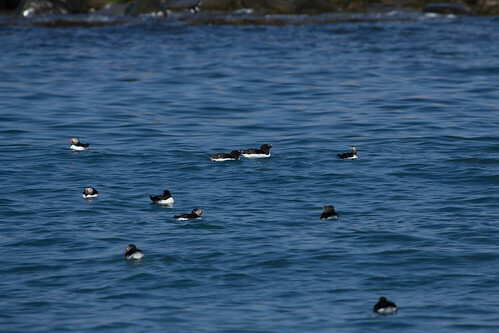 I also spent a lot of time watching Common Murres. 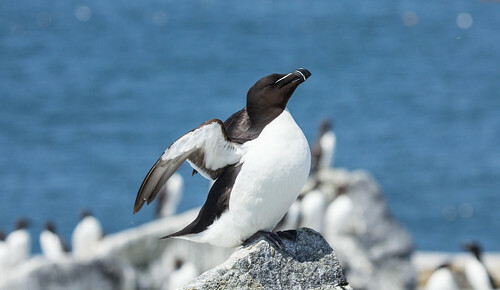 Most of these penguin-like seabirds have solid dark brown heads, but a few have a white circle around the eye punctuated with a narrow line extending back. 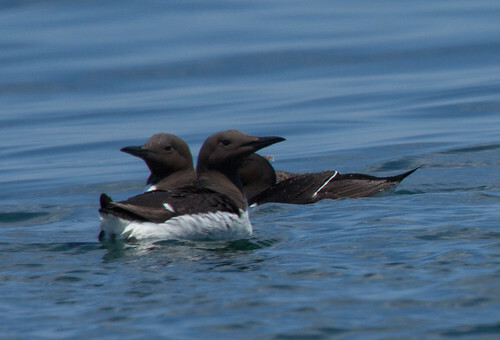 These “bridled” individuals are more numerous further north in Arctic waters, but any advantages or disadvantages of the marking are not known. a few Barn Swallows darted about, and a small group of Arctic Terns flew overhead a couple of times, though they didn’t alight. 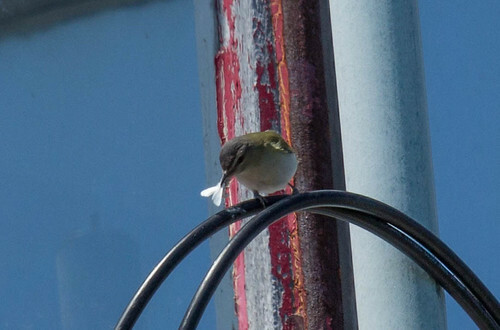 One Red-eyed Vireo spent the entire hour near the light of the lighthouse, catching moths and other insects. But overall, Machias Seal Island belongs to the seabirds. When we left, the Captain took the boat all around the island, so we got good looks at Common Eiders and two species of seals. I arrived back in Cutler Harbor with over 3600 photos and my heart singing with joy. I fell asleep that night still smiling at the end of one of the loveliest days of my life. This entry was posted in Uncategorized on July 4, 2013 by Laura Erickson. 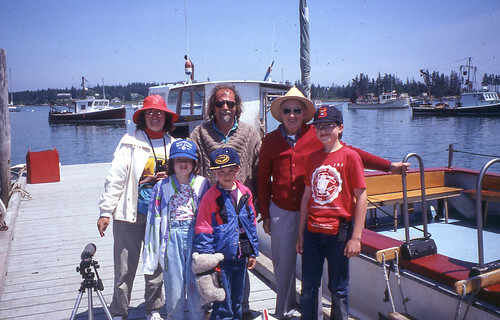 In 1993, Russ and I took a family vacation to New York and New England. For our itinerary, we each chose a place we really wanted to see. Russ wanted to visit family in New York City and Long Island. Joey wanted to stop by every spot mentioned in the poem, “Paul Revere’s Ride.” Katie wanted to see Niagara Falls. Tommy wanted to see and go to the top of the Statue of Liberty. I took parental privileges and chose two spots. 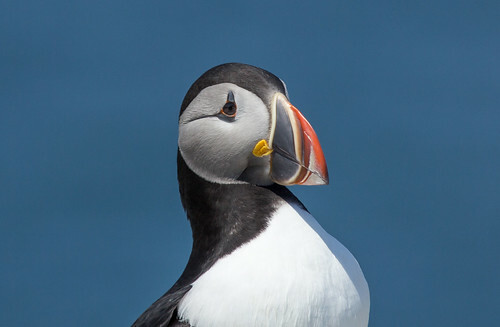 I’d always wanted to go to Walden Pond, and I desperately wanted to see puffins on Machias Seal Island, on the border between the Gulf of Maine and the Bay of Fundy. As far as Walden Pond went, the anticipation exceeded the actual event—I’d expected a tiny bit of natural beauty, but it was a crowded urban beach, the bathroom waste basket overflowing with loaded diapers and other trash piled literally to the ceiling, the noise from competing boom boxes carrying all the way to the far side of the little lake. But Machias Seal Island was everything I’d hoped it could be and more. This tiny island is in disputed territory. The Canadian Coast Guard has manned the lighthouse there since 1832, but the United States claims it belongs to us. 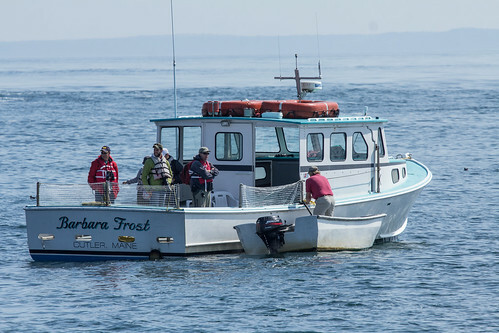 Sadly, because both nations deal with the dispute delicately, neither regulates nor polices the lobster industry in nearby waters, which are becoming overharvested. And neither enforces any border patrol rules, so people from neither country have to show a passport to go on the island. 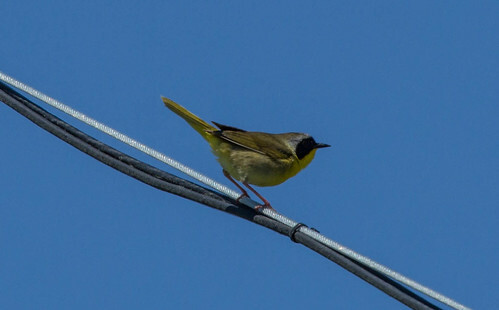 One small American company is allowed to bring a boat load of birders to the island once a day. The small boat is allowed to land on the island when conditions are safe, and a maximum of 16 or 17 passengers is escorted to small observation blinds on the island to view nesting seabirds with a minimum of disturbance. 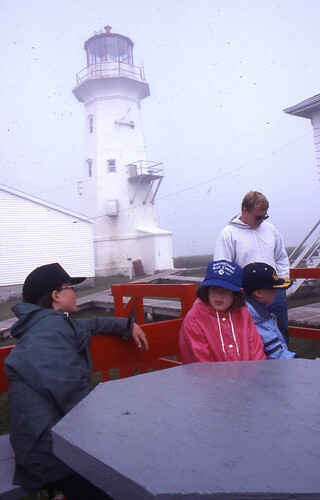 The day we went to the island on July 8, 1993, it was foggy and even a bit drizzly, but winds were reasonably calm and there was little wave action. More passengers were on the boat (captained by Barna and John Norton) than were allowed on the island, and the blinds accommodated a maximum of 4 people. 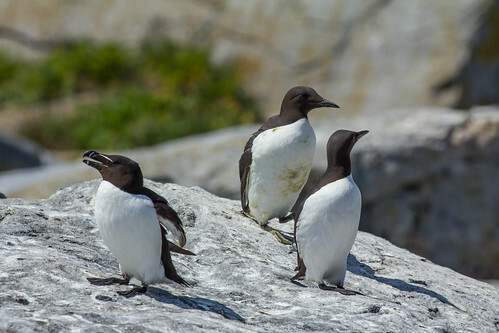 I wanted a perfect experience for Russ and the kids, so they went to the island while I stayed on the boat, which circled, giving us great looks at some spectacular seabirds—Atlantic Puffins, Razorbills, Common Murres, and Pigeon Guillemots—along with Common and Arctic Terns. Russ and the kids got to see all of these species up close and personal—indeed, maybe a bit too much so. Arctic Terns are extremely aggressive in defending their nesting areas. They fly overhead, using their sharp beak to strike the highest point on potential predators. 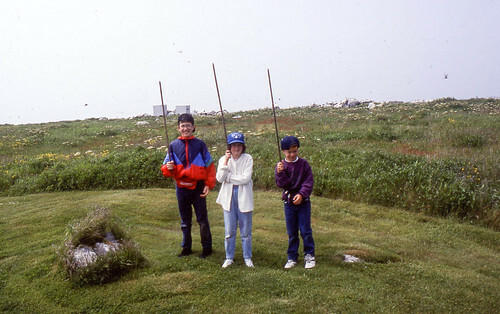 Everyone on the island was required to carry a long pole so the terns would hit that instead of their heads. Russ put his own pole down momentarily to take a photo of the kids holding their poles, and sure enough, an Arctic Tern walloped his head hard enough to draw blood. The kids had finished first, third, and fifth grade a few weeks before, but 20 years later, they vividly remember that experience. 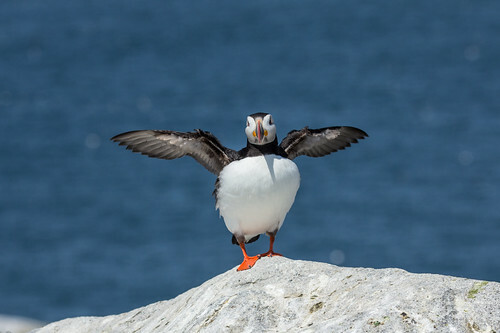 Puffins and Razorbills were barely an arm’s reach from the tiny plywood observation blinds, and they could hear the pitter patter of puffin feet on the roof. 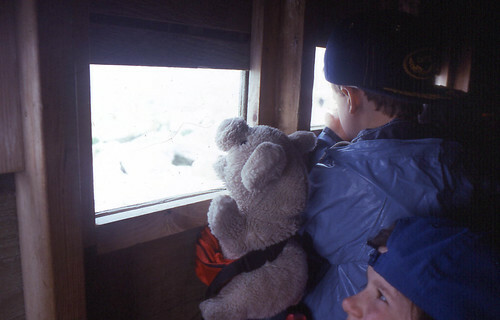 Although only four people were allowed in each blind, the captain kindly made an exception for Piggy, our family mascot, saying he wasn’t human so didn’t count, so he got to see puffins, too. We didn’t have a telephoto lens, but Russ got splendid photos with our 50 mm macro lens. This was far and away the loveliest and most fun birding experience Russ and the kids ever had. 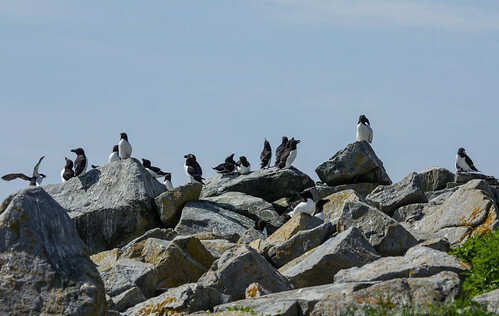 This year I decided to go back to Machias Seal Island for my Conservation Big Year, both so I could add these seabirds to my year list and so I could see how things may have changed. In my next post I’ll tell you how that went. This entry was posted in Uncategorized on July 3, 2013 by Laura Erickson.